Discussion in 'Lexus Lounge' started by krew, Jul 10, 2015. 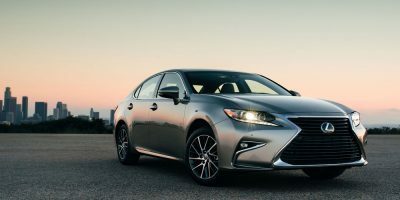 New information on the updated 2016 Lexus ES 350 & ES 300h has been released today, with both models getting a significant exterior refresh, upgraded safety systems, and new interior tech. Lexus did a great job with the update. I'm curious to see what the updated GS will look like though. I hope Lexus will stop shortchanging Canadians. Currently we get fewer individual options (only packages), fewer colours, fewer personalization choices, fewer safety features (except on fully-loaded models which few people purchase), and of course no Lexus Enform at all. Agree with you on Enform compared to the US, our Canadian Nav/Infotainment is as good as a 10-year old Garmin. However, if you compare the rest of what we get in Canada against the US, it's mostly a toss-up, with the NX as an exception where we have a lot more equipment. -NX can get summer fatter rubber on graphite wheels on the F Sport models, in Canada no. - Better availability of RWD models. i.e. RIP GS RWD in Canada unless you go for the 450h. - But, we get Ultrasonic Blue on the IS, they don't but they get more Silver Lining Metallic / Liquid Platinum availability whereas we don't (we just have the more beige-like Atomic Silver). - NX we get AVS and HUD, US misses out on these two really great features especially the AVS which enhances ride quality and body motions/handling. We also more easily get the triple L LED lights while it's much more difficult to get in the US. US does get ASC (Active Sound Control) on the NX and we don't. - We also get standard AWD on all SUVs, cargo net, 4-season mats, and so on. In short, if you go model-per-model, there are tradeoffs between the two countries with no one country significantly better than the other with the exception of the NX (Canada is "luckier"). I agree, we don't have the choice of individual options but we're a 10x smaller market so selection has to be reduced. And I agree, lack of Enform is a BIG omission. As for the '16 ES, it's growing on me the more I see it. Love especially the small but effective interior enhancements! krew, mmcartalk and mikeavelli like this. Very solid updates. Great job here Lexus. Also note ML and the Panoramic Roof can be chosen with any option package! Never my favorite cars, I've driven them fairly extensively. Although I've always viewed ES as well-styled, I'm looking forward to seeing enhancements. Lexus (ES) and Mercedes (CLA) have done a nice job of making these fwd premium cars unique to justify price difference over less attractive regular Accords and Camrys. krew and mikeavelli like this. man i am impressed it looks so much better without the chrome grill. I should have made it clear that I was referring only to the ES and the very restricted availability of important features on those supplied to Canada. corradoMR2 and mikeavelli like this. Lexus GS: Great. Now it'll steal more sales from me. krew, Trexus and corradoMR2 like this. Thanks for the post, Mike. Some useful info and pics on the 2016. A friend of mine, who I regularly swim with in the morning, will be turning his ES350 back in, come September, after a 27-month lease. If he decides on another ES (assuming he doesn't buy his existing car out, which I don't think he will do because of its low depreciation and high residual price), this might help him decide between a new, end-of-model-year 2015 ES or a new 2016, which probably will just start to be available around then. Myself? I like the existing front end and body-styling of the 2015 better, but prefer the 2016's interior updates. I made my choice in May. Traded a 2013 Matador Red Mica ES350 for a 2015 Matador Red Mica ES350. New updates didn't seem worth waiting for. Great photos, shows off the update nicely. Amazing how much little details added together make a difference! To me the front end looks MUCH more luxurious with this update, and the interior has much-needed improvements. Not major interior improvements, but I am expecting that for the next-generation ES. Guess that color is addicting, eh? Twice in a row. Flaxen brown interior looks fantastic. Any estimates on when the 2016's will start arriving ? CIF and mmcartalk like this. To me the front end looks MUCH more luxurious with this update, and the interior has much-needed improvements. Not major interior improvements, but I am expecting that for the next-generation ES. I swear -- I squint my eyes a little bit and the front end of the ES looks like an RC. Very unexpected. Great breakdown, thanks for sharing! Squint a little more, and it will probably look like most of the other Lexus front-ends. Yeah, I know. It's getting tougher even for a Lexus connoisseur like moi!